Whether or not you believe that the government is snooping around in our private emails, texts, and phone calls, it wouldn't hurt to protect ourselves a little better in the digital realm. If you're worried about them (or whoever) eavesdropping on your digital messages, taking a few extra precautions could ease your mind, while making digital communication more fun and exciting overall. Text to Color is a free Windows application that helps you convert text files into images (and vice versa). The process works by using the image's pixels to represent letters and combing those pixels to form a single, unified image. This kind of hidden messaging is called steganography, and we've covered a process like this before in a three-part series that showed how to hide text in the negative space of photos, add hidden archives to images, and hide entire messages and photos inside other photos. 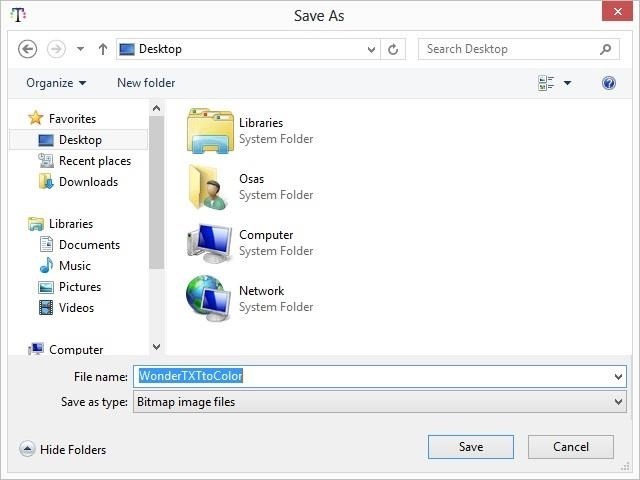 While those methods are definitely legit, they do require a little effort and manipulation of file names and paths. If you just want a quick and dirty method to send hidden messages, then Text to Color should be your weapon of choice. I'm using Windows 8, but it works on any version of Windows from 2000 up. If you click OK, the program will not run. Instead, go to More info and click Run Anyway. Once the program starts, you will be taken to a simple text box and can begin to type your message. Once you're finished with your message, click on Encode Text and your message will be converted into an image. The image will appear in the white box pictured in the bottom left-hand corner above. The more text you write, the bigger the image will be. Once your message has been encoded, you can save it to your computer and send it off. You can also use Text to Color to decode images, which the receiver will need to do in order to read your message. I'll decode the image that I just sent to myself. 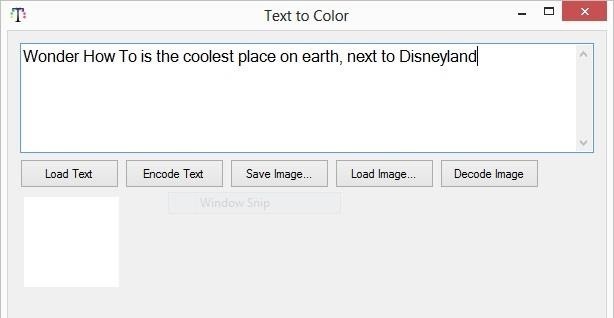 In Text to Color, hit the Load Image button and grab the image you just created, which should be a Bitmap (BMP) file. Once loaded in the program, hit Decode. You will then be taken to the next window, where you can save the decoded message as a text file. When the message is saved as a text file, you can open it up and read the decoded message in Notepad or a similar program. You can also upload a text file and decode it with Text to Color. This is a very easy way to send encoded messages without having to put in much work. And if you want to get even more tricky with your images, be sure to read this awesome article on adding all sorts of hidden files inside your images to save space and fool Flickr—or just to send out hidden files to your friends. How To: Write a Basic Encryption Program Using Java!